"Anyone may so arrange his affairs that his taxes shall be as low as possible; he is not bound to choose that pattern which will best pay the Treasury; there is not even a patriotic duty to increase one's taxes...."
At Flaster Greenberg we take seriously the desire of our clients to legitimately minimize their taxes. 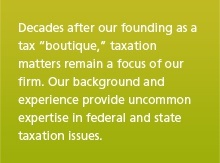 Founded more than 45 years ago as a "tax boutique,” today federal and state taxation continues to be an important focus in our firm. Whether this means counseling a large corporate client as to the intricacies of a tax-free reorganization, a real estate developer or investor as to the means of achieving capital gain rather than ordinary income tax treatment, or an individual seeking to preserve wealth for his or her children and grandchildren, the skills and experience of our attorneys as tax advisors is a valuable and pragmatic resource for our clients. To help you quickly and easily access key federal and state websites, our attorneys have put together a resource page that contains links to important information and tools you can use. Click here to visit our Business and Taxation resource page. 2018 Tax Reform Series, Part I: Choice of Entity - Should I Elect a Different Tax Status for My Entity Before the March 15th Deadline? Taxes in New Jersey... Approaching the Tipping Point? Only morons pay the estate tax? A Philadelphia attorney takes a look at Gary Cohn's alleged quote.